Reduce your water expenditure and get rid of bad smells. Save 1.5 litres of water with each use. 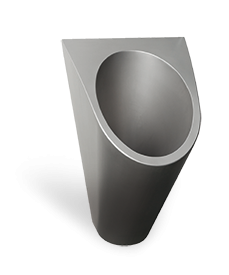 We have equipped our urinals with patented seals for which we - as the only ones in the world - guarantee the lifetime and 100% functionality for a minimum of 6 months..
Each flushing of a traditional urinal requires 1.5 litres of water. The waterless urinal is not connected to the water mains and so you save with each use. 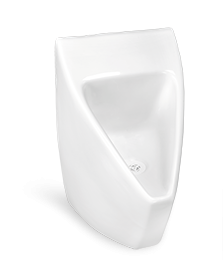 The urinals feature a special finish on which impurities do not stick. The maintenance does not take more than 20 seconds a day – just spray them with our biological cleaner. Our patented P1 seals are the only ones on the market that effectively prevent odours from spreading for at least 6 months. Competing seals need to be replaced after 2 to 4 months. Urinals of sanitary ceramics. Their special finish and shape prevent urine drops from staying on the urinal and from dripping down to the floor. Urinal maintenance does not take more than 20 seconds each day: it is enough to spray it with our biological solution once a day. Stylish urinal in the stainless steel ‘anti-vandal’ form. The stainless steel dish is very durable, its finish and shape prevent the urine from dripping on the floor. The urinal does not need connecting to water or electricity mains and is 100% odour free. 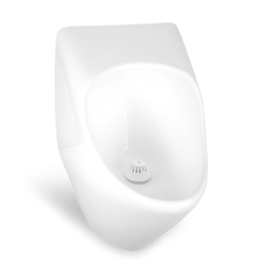 Fibreglass urinal with a special Gelcoat finish. No urine drops stay on the surface and that further adds to the maintenance simplicity: it is enough to spray the urinal with our biological cleaner once a day. Our seal is the only one that prevents 100% of odour from spreading for 6 to 18 months. We can make this urinal for you in any RAL colour. The urinal troughin the stainless steel ‘antivandal’ form is ideal for facilities with a large turnover of people in short times, such as football stadiums, sports facilities, restaurants, etc. The stainless steel dish is very durable, its finish and shape prevent the urine from dripping on the floor. 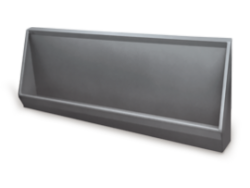 The trough does not need connecting to water or electricity mains and is 100% odour free. How many people use the urinal? How many times a day does each user use it? How many days per week is the urinal used? Do you want to save your company's operating costs? We trust our urinals. You will receive a 5-year warranty for their surface finish from us.